This is Miss Kitty. Don't mess with her. Actually, despite her fierce robin & lizard-stalking glare, she's a sweetie and a half. She's here today paying us all a visit because I'm feeling depressed & overwhelmed - I may have to buy a new car & it's stressing me out & annoying me because I don't want to spend the money unless I can get what I want (which means in addition to specific features, it's got to be white, and I am exhausted with seeing UT orange vehicles - pretty much the same color as Miss Kitty's eyes) - and Miss Kitty always makes me smile. She lives with the lovely lovely Katie & her fiance, the usually-packing-heat, etc, etc, Robert, and today she is missing Robert for the 5th day in a row because he is off taking photos of paintings for The Tyler Museum of Art. I believe. I know he's shooting paintings (no doubt there's some he'd like to literally shoot, but that's just me talking, not him), and I assume it's for an upcoming show for the museum. And yes, I changed my banner (at least temporarily) - I just feel the need to see something lighter when I come here. This is the catawba tree across the street and when it blooms I'll post a picture of its gorgeous white flowers. I thought the new banner would add color to this blog, but I can see it doesn't - I swear, I must be color-phobic. I am intrigued? What is a Sapphire Dragon tree? Sounds wonderful. I wonder if it's too cold up here for it? I see you got your pictures back up. 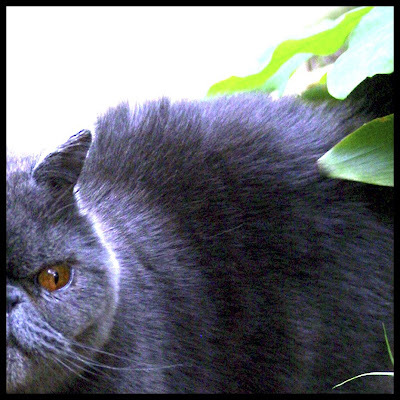 I grew up with a dark grey Persian with eyes that color. He was beautiful! Can't believe that this time next week, I'll be kicking back in Texas! I'm so excited! Christy - I sent you all the info I know re: the Sapphire Dragon. Be sure & check your email. Looked up the Sapphire Dragon tree and found some really good information on it. Sounds like a real PIA! Definitely wouldn't grow here and needs heavy pruning and lots of water, no way....but it sounds beautiful. Just WAY too much work...Oh well!